The game is full of lovely art like this. By now you've hopefully read our Solatorobo: Red the Hunter review, and if the 20-hour story mode isn't long enough for you there's good news: it doesn't end there. Nintendo has just given more details about the game's free downloadable quests that keep the action going after the credits roll. The first quest, available today, puts the canine Red Savarin in full-on Lassie mode, rescuing someone lost down a mine; in quest four, Red teaches the importance of fire prevention. Full details and information on how to download the quest is below. North American users, you have to wait for your chance to grab the game as it's set for release later this year. 15th July 2011: Get ready to explore even more of the mythical floating islands of the Shepherd Republic as Nintendo launch four new quests for Solatorobo: Red the Hunter the new action adventure game which was made available across Europe on the 1st July 2011, exclusively for the Nintendo DS family of portable systems and which can be enjoyed in 2D on your Nintendo 3DS system. Solatorobo: Red the Hunter allows you to enter a world of epic fantasy action in a high octane RPG. The game has been created by internationally renowned designers, Nobuteru Yuki, and animated by MADHOUSE. 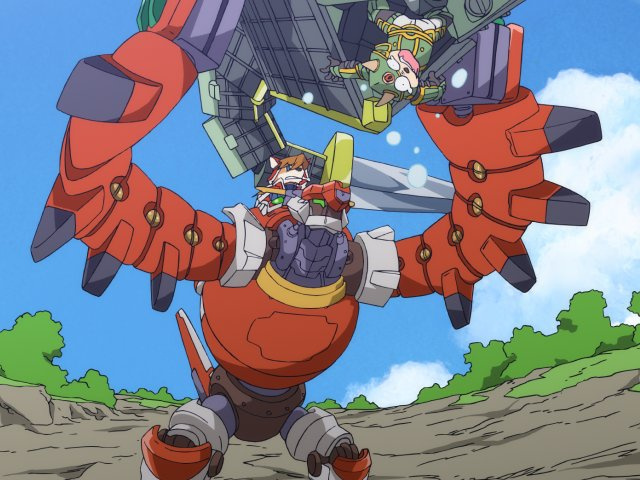 You take on the story of Red Savarin, a 17 year old anthropomorphic dog, and his robot, Dahak, as he battles with a giant robotic “mecha” and other enemies on his journey through the Shepherd Republic. After a chance encounter with the mysterious Elh, he gets inadvertently entangled in an epic adventure to save the world from destruction at the claws of the ancient evil being, Lares. 1) Select "Quest Download" from the main menu. 3) Next, select 'Download' from the menu. 4) Once the connection is completed you'll find new assignments in-game at the Quest Brokers around the Shepherd Republic. 5) Don't forget to check back regularly as new quests become available. I'm really looking forward to this game. It's definitely set to be released in the USA, right? It'll be nice to have a solid game to play on the DS before it's completely abandoned in favor of the 3DS. Another reason for me to get my skates on and buy this thing. Ordered it yesterday....so that's really nice to hear. I didn't know for a long time that this game is the "spiritual sequel" to Tail Concerto on the PS1. That's amazing, that little gem is one of my favorite games for the system. Does anyone know where I can order a copy? I need to import to South Africa, and my normal UK suppliers aren't stocking this. "Hunt Down New Solatorobo Quests Every Week"
...If you can hunt down the game!!! Solatorobo is a great game and I recommend it. However I am tired of the build in secret quests that are just unlocked via wifi and are not real DLC. I will try to use Action Replay to unlock them.